FORT LAUDERDALE, Fla. (Feb. 24, 2012) -- The Army's chief of staff has already said the Army will attempt to provide better support to combatant commanders -- the Department of Defense-level commands responsible for U.S. military interests across large swaths of the globe. Now, the Army may assign units, within the Army force generation model's reset, train and available phases, to specific combatant commanders, said Chief of Staff of the Army Gen. Raymond T. Odierno, Feb. 24, during the Association of the U.S. Army's Institute of Land Warfare Winter Symposium and Exposition. Chief of Staff of the Army Gen. Raymond T. Odierno said that, despite budget cuts and shrinking end-strength, the Army would not forget wounded warriors or families, during the Association of the U.S. Army's Institute of Land Warfare Winter Symposium and Exposition in Fort Lauderdale, Fla., Feb. 24, 2012. "We will adjust the process where active-duty and reserve-component units advance through a reset phase, a training phase and an available phase and prioritize their training and planning in support of a specific combatant command and mission sets," Odierno said. The general said the strength of that concept is that it gives combatant commanders the ability to reach out to units and to include them in planning and "to include them in what they are trying to do in order to shape their region." The process would also allow associated brigades to become familiar with particular regions, he said. More brigades will understand what's going on in the Pacific, for instance, or there could be brigades associated with the Middle East, and brigades doing exercises with NATO partners. "It's the ability for us to project our capabilities across all the combatant commands," Odierno said. "It'll be for the development of our leaders, it'll be good for establishing strong relationships." By the end of fiscal year 2017, the active-duty Army will decrease its end strength from 570,000 to 490,000. The Army National Guard will reduce from 358,000 to 353,000, and the Army Reserve has reduced to 205,000. Decreased end strength will result in at least eight fewer active-duty brigade combat teams, known as BCTs, Odierno said, and the Army will go from 45 BCTs to 37. The first two reductions will happen in Europe. There, the 170th BCT will inactivate in fiscal year 2013, and the 172nd BCT will inactivate in fiscal year 2014. Remaining decisions on who will deactivate have not yet been made, he said. The general asked the Army's Training and Doctrine Command to lead an analysis of BCT design. "Modularity has served our Army very well, and we will not walk away from it," the general said. But "we now have the time and opportunity to study and recommend changes to our BCT organization." Early feedback from that analysis indicates "that significant flexibility and capability would be gained by adding a third maneuver battalion and more engineers to our brigade combat teams." If a decision is made to do that, he said, it could cause the Army to reduce further the number of brigade combat teams, from what is planned at 37 to possibly 32 or 33. "Such a reduction represents an investment in the overall number of battalions in combat formations, while reducing overhead with brigade-level headquarters," he said. While no decisions have been made, they are "foreseeable possibilities." Even with troop cuts and brigade combat team cuts, Odierno said he believes the Army can still be an effective fighting force. 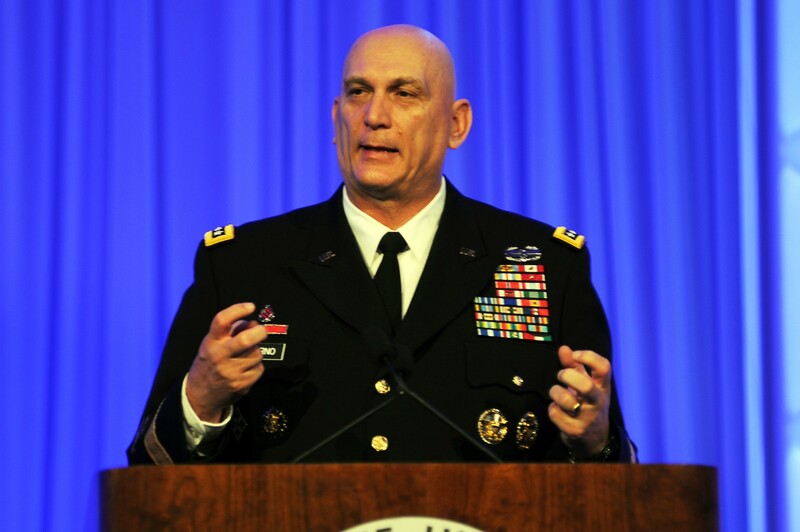 "From a combat perspective, I believe with 490,000 [Soldiers], and 32 brigades or 37 brigades, with 20 brigades of aviation and with the amount of engineers we have, I do believe we could fight two simultaneous wars," Odierno said. "My concern is if they become [extended], that would be a problem. We can fight two Desert Storms if we have to. What we can't fight right now is two Iraq's that go on for eight years." To handle a counter-insurgency like in Iraq, Odierno said, the Army will need to get more nations involved. "It can't be just the U.S."
As the Army moves forward, budgets shrink and end strength is reduced, Odierno said one thing that won't change is the Army's commitment to Soldiers and families. For wounded warriors, the general said, the Army remains committed to keeping its promise. "The wounded warrior program will continue to exist," Odierno said. "We are not going to forget our wounded warriors; we are not going to forget our families. We have invested a lot of money here to ensure they understand that if you are part of this Army and you are injured in any way, we are going to take care of you." Over the next five to 10 years, the general said, he expects a rise in post-traumatic stress, and said infrastructure associated with wounded warriors needs to be in place. The general also said the Army's new vice chief, Gen. Lloyd J. Austin III, would continue to champion the Army's efforts to treat post-traumatic stress and traumatic brain injuries in the same way his predecessor, Gen. Peter W. Chiarelli had done. Army family programs will also continue, Odierno said. This year, family programs have not been reduced in the budget request, but have gone up. The Army is asking for $1.2 billion this year for family programs. But the general did say the Army must "clean up" those programs to reduce redundancy and inefficiency. "The main problem we have is making sure people aren't confused about what's available for them," he said. There are so many programs he said, some don't know how to get access to them.